A pinhole camera is a simple camera made out of a light-tight box or similar container. Light enters the camera through a tiny pinhole and projects an image onto light-sensitive paper at the back of the camera. Studying and working with a pinhole camera can help you understand how more complex cameras work, as well as how our own eyes work. A pinhole camera has no lens. Light entering a pinhole camera passes through a hole, rather than through any glass or focusing apparatus. The human eye, on the other hand, does have a lens. According to the University of Edinburgh School of Informatics, light entering the eye must pass through the cornea, the aqueous humor, the lens and finally the vitreous humor before it hits the retina at the back of the eye. Because a pinhole camera has no lens, the photographer cannot focus it on individual objects. As a result, pinhole cameras have very wide depth of field, meaning that much more of an image’s foreground and background appears in focus in a pinhole camera image than in an image taken with a camera with a lens. The human eye more closely resembles a camera with a lens, in that it can focus on particular objects. According to the University of Edinburgh School of Informatics, muscular adjustment of the eye’s lens allows it to focus on particular objects. Eyeglasses and contacts can correct faulty muscular adjustment of the eye’s lens. Because it has no lens, a pinhole camera has no variable aperture; unless you break a larger hole in the camera, light must always pass through the same sized hole. Photographers using cameras with lenses, on the other hand, can choose to open or close the lens’s aperture, allowing more or less light to pass through the lens. The human eye functions this way as well. 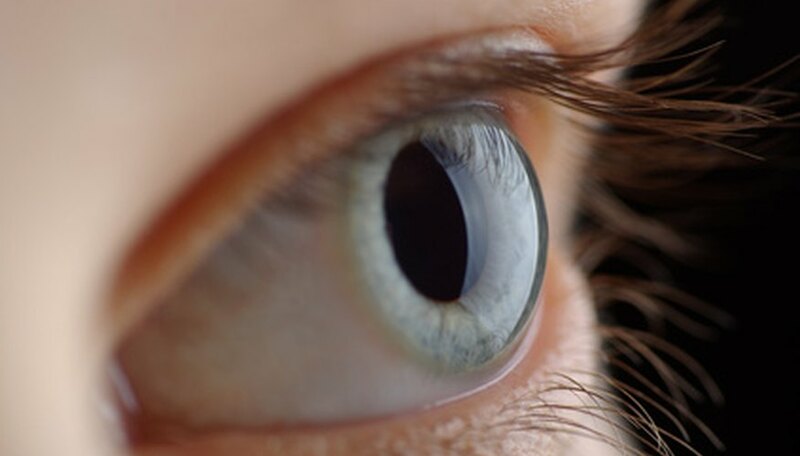 Our pupils can open or close, or dilate or shrink, to accommodate different light conditions. A pinhole camera, like most other cameras, has only one hole, making its angle of view quite different from that of a human. Humans see through two eyes, combining visual information from both to produce one image. Because pinhole cameras allow light to pass through only one hole, the images they produce often have a strange perspective, with subject matter curving around the edges in extreme cases. Light passes through both pinhole cameras and human eyes to project an upside-down image. In a pinhole camera, light passes through the pinhole to project an upside-down image onto the back of the box, and in the human eye, light passes through the lens to project an upside-down image on the back of the retina. The brain then flips that image so that we experience it with the right side up.